Born and raised in rural Ontario, Dr. Gardiner grew up with several cats and dogs, two hamsters and a budgie as part of the family. He vividly remembers the family dog that passed away of heartworm disease after a lengthy and mysterious illness, bringing the awareness of veterinary medicine to the forefront at an early age. He always loved their family pets, but his dream of becoming a veterinarian was truly solidified while working on two local dairy farms as a teenager and as he moved on into university. 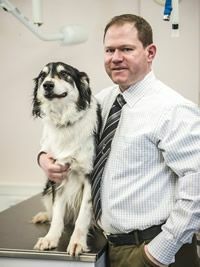 Dr. Mel Cirinna graduated from the Ontario Veterinary College in 2009 and began working in small animal medicine in Kitchener. In 2012 she joined the Woodlawn Veterinary Hospital team. Dr. Mel’s childhood home was always full of animals which fostered her love of animals and desire to pursue a career working with them. She has a strong interest in feline medicine and the care of geriatric pets. Dr. Mel lives in Guelph with her husband and their three daughters. When not working she can be found enjoying the outdoors with her two and four legged family members or training for her next obstacle race. 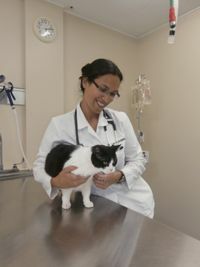 Having spent her childhood living above a veterinary hospital, Dr. Lori has always known that she wanted to be a veterinarian. 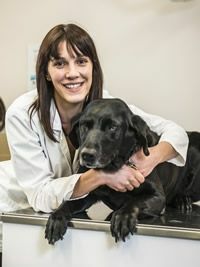 As soon as she finished high school, Dr. Lori moved to Guelph with plans to attend the Ontario Veterinary College. She graduated in 2008 and currently resides just north of Guelph with two dogs and two cats.